The cryptocurrency world is in a fuss about Bitcoin and rightly so, with the cancellation of the SegWit2x hardfork and the sudden drop in pricing by nearly $1000 per BTC. 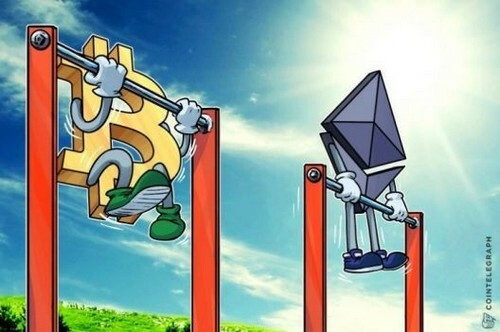 However, the price drops and news has kept Bitcoin in the limelight while Ethereum has slowly been making improvements and growing its network. The second largest market cap coin has seen substantial use cases arise as the ICO world continues to flourish and new ERC20 and ERC223 tokens are created. Recent reports by the Ethereum Foundation indicate that Ethereum processed 44 percent more transactions than the Bitcoin Blockchain, showing the power of the Ethereum system. Further, the total number of pending transactions for Ethereum has been stable between 30 and 300, while the same figure for Bitcoin has fluctuated anywhere from 39,000 to 47,000. The ZK-SNARK protocol, released on the Ethereum platform with the Byzantium hardfork, was quickly criticized by some tech insiders because of its risk of attack from quantum computers. While some had posited that the Ethereum fork would produce a Wall Street adoption boom, the risk from quantum computers has kept adoption steady. A recent paper by Ethereum founder Vitalik Buterin indicates, however, that a new protocol called the ZK-STARK has been conceptualized in order to protect a full zero-knowledge transaction, even from quantum computing. This protocol relies only on hashes and information theory, rather than the ‘trusted setup’ of its ZK-SNARK cousin. The upgraded anonymity, while perhaps necessary for such applications as public or fiscal Blockchain transactions, does come at a data cost – from 288 bytes to a few hundred kilobytes according to Buterin. However, in fields where anonymity is paramount, the additional data would provide something that no other system to date can accomplish – fully secure and fully anonymous transactions. With the rise in transaction volume, the increased speed of transactions, and burgeoning technology use cases, Ethereum may be poised for greater market growth in the coming months.